I believe the starting point of any painting is to feel the subject and then to imagine the completed painting in my mind’s eye. This is the most important consideration before I begin. I’m inspired by everyday life street scenes: bars, cafés, landscape, seascape, people and animals all make great subjects combined with light atmosphere and a story. Most of my work does have a continental look influenced by painting in Europe, France, Spain, Malta and Italy. I retired 5 years ago and in that time I have developed my outdoor painting skills while travelling around Europe. I have become much more instinctive and passionate about the medium in creating a fluent painting that produces mixing and blending soft and hard edges and letting the picture paint itself. Not ending up with an illustration is paramount in my style of art. 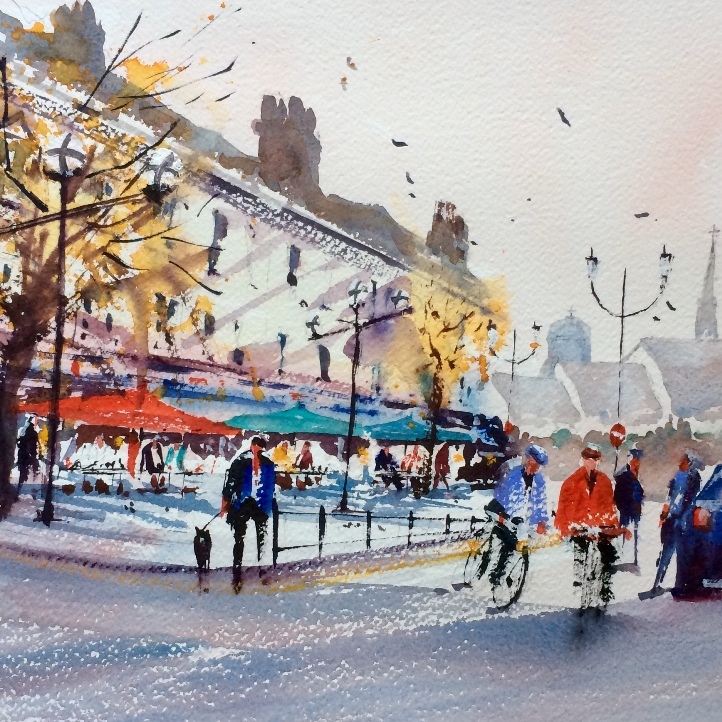 All of my work is watercolour which can be very challenging and rewarding.